The following steps guide you through the ArcGIS Server installation process on one machine using the setup user interface. If you're installing ArcGIS Server on multiple machines, see the instructions in Install ArcGIS Server on multiple machines. Obtain an authorization file for the machine on which you're installing ArcGIS Server. Make sure the user has full permissions to the ArcGIS Server installation directory. The user account used to install ArcGIS Server will be the account used to run the software. Group users and all others must have at least execute permissions to the ArcGIS Server installation directory. Note that installing ArcGIS Server with the root account is not supported. For more information, see The ArcGIS Server account. Navigate to the directory where the ArcGIS Server tar file was uncompressed, or insert the ArcGIS Server media into the appropriate drive and browse for Setup to launch the setup program. You cannot install ArcGIS Server on a shared network directory (NFS mounted folder). The directory must be local on the target system. The instructions below describe how to install ArcGIS Server from the setup user interface. For instructions on installing ArcGIS Server silently from the command line, see Install ArcGIS Server silently. The installation mode that you choose will determine the default uninstallation mode. For example, if you choose to install from the setup user interface, the uninstallation will default to the user interface mode. The setup program begins by checking the prerequisites that must be met to successfully set up and use ArcGIS Server. If all the prerequisites are met, the Introduction dialog box displays. Click Next to proceed. On the Master Agreement dialog box, read the master agreement. If you accept the terms, select the I accept the master agreement button and click Next to proceed; otherwise, exit the setup by clicking Cancel. On the Choose Install Folder dialog box, specify the installation location. The name of the installation directory should be lowercase. The samples and data bundled with the installation require the data path to be lowercase. On the Pre-Installation Summary dialog box, click Install to start the installation. Approximately 1.5 GB of the required disk space is used only during the installation of the product. This temporary disk use ceases at the end of the installation. Upon completion of the installation, follow the directions on the screen. Use the shortcut on your desktop environment: ArcGIS > Authorize ArcGIS Server. Run the authorization script: <ArcGIS Server installation directory>/tools/authorizeSoftware. For more information about this authorization tool, see Authorizing ArcGIS Server silently. Select this option if you do not already have an authorization file. When this option is selected, there are several methods to provide your authorization information. Select the authorization method you want to use (see the Authorization Method screen capture below). This is the method by which you will provide your authorization information. Select this option if you have already authorized ArcGIS Server but want to authorize additional extensions (if available). When this option is selected, there are several methods to provide your authorization information. 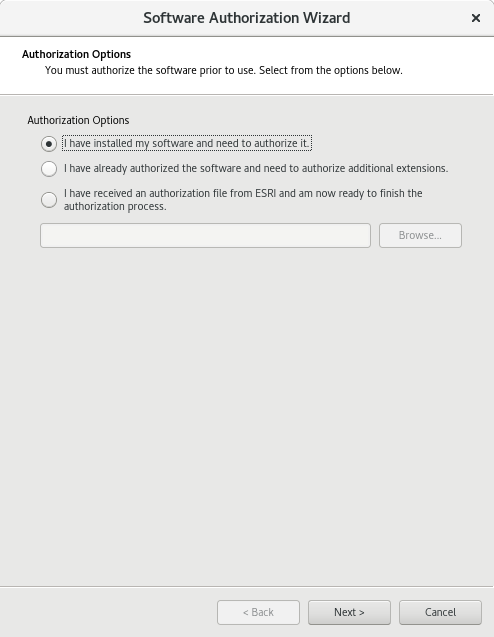 Select the authorization method you want to use (see the Authorization Method screen capture below). This is the method by which you will provide your authorization information. Authorizing now using the Internet enables you to receive the authorization file immediately. It requires an Internet connection. 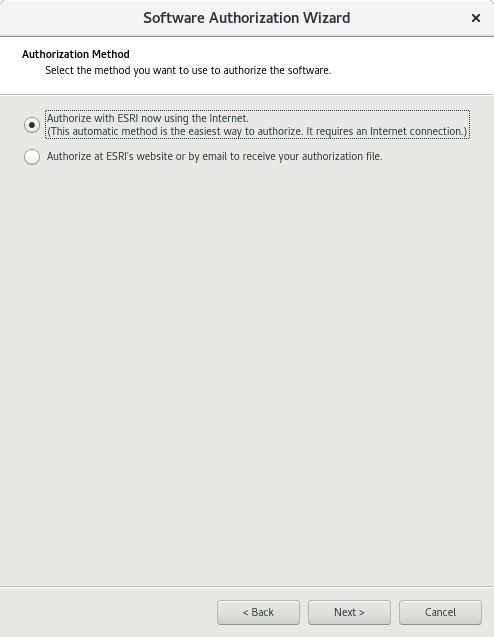 Select this option if you have already received your authorization file from Esri Customer Service. With this option, you can browse to the location of the file received from Esri Customer service to complete your authorization. After the installation is complete, ArcGIS Server Manager is automatically launched in Mozilla Firefox. You will also be able to access Server Manager manually from any supported web browser by navigating to http://<server name>:6080/arcgis/manager. For more information, see the ArcGIS Server help. Follow post-installation instructions to configure ArcGIS Server to start with the operating system. Esri recommends using the serverScan.py script to check for security best practices with your ArcGIS Server after installation. If you want ArcGIS Server to start with the operating system, complete the steps specific to your operating system. Within a command shell, switch to root user. This file is installed with ArcGIS Server 10.7. To verify that the systemd service is properly configured, restart the service and check its status. Reboot the operating system and verify that ArcGIS Server restarts properly. If you install ArcGIS Server on a Linux machine that includes systemd v228 or a later version, you may need to enable and raise the systemd limit to 512 maximum threads if the ArcGIS Server machine is heavily used. (For example, SUSE Linux Enterprise Server (SLES) 12 SP2 includes systemd v228.) Setting systemd to a maximum of 512 threads can prevent any single service from spawning too many threads and consuming all server resources. Change directory to the applicable init.d folder and check the arcgisserver script to make sure that root has at least read and execute permissions. Update the agshome variable to the ArcGIS Server installation directory, for example, /home/username/arcgis/server. Save the edits to the arcgisserver script. ArcGIS Enterprise can be deployed on machines that have multiple network interface controller (NIC) cards. If you installed ArcGIS Server on a machine that contains more than one NIC card, you must identify which interface the server should use for network communication. This is done by adding a file into the installation directory for each machine in the site.. Perform these steps immediately after installing ArcGIS Server and prior to creating the new server site. Log in to the multi-NIC machine where Portal for ArcGIS is installed. Navigate to the folder <Server installation directory>/framework/etc. Create a new file named hostname.properties, with appropriate permissions, inside this folder. Add the following text to the first line of the file, and specify the fully-qualified domain name of the intended interface: hostname=interface.domain.com. For example, if you have a machine with two NIC cards (1 and 2), these interfaces' domain names resolve to S1.mycompany.com and S2.mycompany.com, and you want ArcGIS Server to use the second interface for network communication, add this text to the hostname.properties file: hostname=S2.mycompany.com. In some cases, as when a hostname is identical for multiple interfaces, you should instead specify the IP address of the interface you want ArcGIS Server to use for network communication. The syntax is hostname=<IP address>. Restart ArcGIS Server using the stopserver.sh and startserver.sh commands. Repeat with other machines in your ArcGIS Server site as necessary. After completing authorization, ArcGIS Server Manager should already be open. You are now ready to log in to Server Manager and create a new site. For more information. see Create a new site. If you are preparing your site for a production deployment, you should install the ArcGIS Web Adaptor. The Web Adaptor provides a link between your enterprise web server and your ArcGIS Server site. It allows you to choose the port, address, and authentication settings that you want to use for incoming requests. It also prevents outside users from accessing Server Manager and the Administrator Directory. For more information, see About the ArcGIS Web Adaptor. Most of your work publishing services occurs in ArcGIS Desktop, where you create your maps, globes, geodatabases, and so forth. To publish a service directly from ArcGIS Desktop, define a connection to your server using ArcCatalog or the Catalog window in ArcMap. Once you've done this, the connection information is saved on your machine and you can then reference it whenever you want to publish a service. If you make the connection with administrative privileges, you can also perform some server administration functions from ArcGIS Desktop. See Connect to ArcGIS Server from ArcGIS Desktop for instructions. Ensure that ArcGIS Server can access all the data referenced by its services. For more information, see Make your data accessible to ArcGIS Server. With a connection to the server established, you can begin publishing your GIS resources as services. To add a service, follow the directions in How to publish a service. Once you add services to your GIS server, you can use them in many types of applications. These include applications that you create with the ArcGIS Web APIs and Native SDKs, or Configurable Apps and App Builders. Alternatively, you can view services in desktop-based applications, such as ArcGIS Explorer, ArcMap, or ArcGlobe. Mobile devices, such as the iPhone, Android devices, and Windows Phone, can also use your GIS services. See About creating web GIS applications to get started.